Legendary British institution Chas & Dave have recently re-formed following Dave's retirement two years ago and are currently in the middle of an extensive and near-sellout (mainly British) tour. The hugely respected London musicians have (either individually or as a band) supported The Beatles, Led Zeppelin (Knebworth) and Jerry Lee Lewis among others and had a track sampled by Eminem. This set contains Chas & Dave's breakthrough albums, the first two on a major label - Rockney (EMI 1977) and Don't Give A Monkeys (EMI 1979), showcasing their 'rock+cockney' musical style properly for the first time. The two albums feature three of their biggest original hits - the well-known Gertcha, Sideboard Song and Rabbit. The set also contains the Live At Abbey Road LP (EMI 1979), which has now been expanded with seven bonus tracks from that famous gig in January 1979, recorded live in Studio 1 with star guest musicians such as Eric Clapton and Albert Lee. The third CD in the set collects together Chas & Dave’s ‘Odds & Sods’ including five previously unreleased tracks from the same 1979 Abbey Road live show, three b-sides and seven tracks from a 2005 recording session at Abbey Road. The set is completed with a DVD of the Live At The Shepherd's Bush Empire Christmas gig, filmed during their high-profile revival in 2005 when they also released a top selling Greatest Hits album on EMI, made a sensational performance at the Glastonbury Festival, supported the Libertines, and received considerable media exposure on national TV, radio and press. Packaged together in a multipack, with liner notes written by long-time fan Phill Jupitus and five previously unreleased tracks across the 3CDs and DVD, ‘Gertcha! 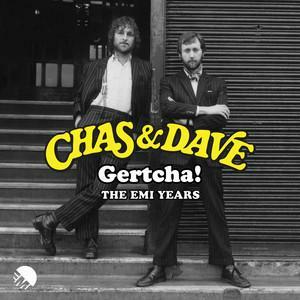 The EMI Years’ presents a comprehensive overview of Chas & Dave’s extraordinary career.